Two weeks ago, my mom and I had the pleasure of seeing one of my favorite bands of all time: Fleetwood Mac. I’ve been a fan of Stevie Nicks for as long as I can remember – trying to dress, sing and write songs like her as a child – but there is only one Stevie, the incomparable Ms. Nicks, and she’s definitely still got it. They rocked the house. Prior to the concert, we treated ourselves to a nice dinner, to give us energy for all that singing and grooving. After a tasty sip at Bubble Charlotte, a new champagne bar in the Epicentre, we ventured to BLT Steak. Connected to the Ritz-Carlton, where the Mac was staying, I had my eyes peeled the entire meal. Save up your bones, because this will cost you a pretty penny, but it is outstanding. Very NYC. 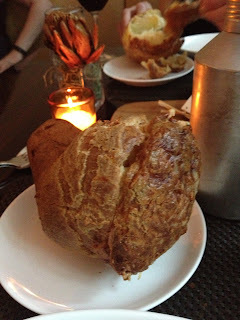 A seasonal drink of Strawberry Juice, Vodka and Lemon-Thyme Syrup quenched my thirst, but I was more excited by the three humungous Popovers that arrived to our table. They were the size of my head. Flaky, warm, with notes of parmesan cheese – I could get used to bread service like this. The Beefsteak Tomato Salad presents three beautifully ripe, juicy tomatoes, dressed with a Grilled Onion Vinaigrette, Stilton Cheese (Blue Cheese’s sister) and fresh Basil. This is perfect for summer, especially with such high-quality, fresh ingredients. I want to try and replicate this in my kitchen. The entrée special was plenty to share. A Grilled Halibut Filet is topped with a Green Tomato Salsa, Pattypan Squash and Fried Squash Blossoms. I had never had squash blossoms, but see them featured all the time on “Iron Chef,” so I was pleased to finally have a taste myself. The batter was light and delicious, with a salty, almost juicy bite of the squash inside. The green tomato salsa was a colorful and fresh addition to the fish, which had a crunchy exterior, but wasn’t fried. I like that form of preparation. As a side, Grits & Gorgonzola seemed perfect. Served in a tiny cast-iron dish, they were creamy, savory, with a flavorful layer of Gorgonzola on top. I couldn’t wait to dip my spoon into that cheesy crust and ladle them onto my plate. I may have used my popover to wipe up some of the grits. Shh. My favorite part of the meal was perhaps the amuse bouche dessert, if you will. Three bite-sized Mocha Macarons hit the spot – crunchy and flaky on the outside, with a chewy filling on the inside – how did they know I love to end my meal with just a little bit of sweetness? Performing hit after hit - “Second Hand News,” “Landslide,” “Don’t Stop,” – the Mac is back. All of them except Christine, that is. If you don’t have the “Rumours” album, I just insist that you get your hands on a copy and engulf yourself with the magic. It will change you. Now if any of you have killer popover recipes, send them my way.